I began this series behind most of the die-hard Martin fans. Although I am a huge Fantasy fan, I read a lot of YA as well, as it is my genre. Due to do this, Martin stayed on my back burner. Until recently. I sped through the first three books. Within days. Literally. I couldn’t get enough. A Game of Thrones, A Clash of Kings & A Storm of Swords were consuming stories. A Feast for Crows, however, threw up a road block, and had me crawling to the finish line. It was a slow read. Very slow at times. The storyline of AFC needed to be split in half due to what would have been a brain-numbing amount of content. The book in its entirety would have simply been too long. Well over 1,000 pages. And I mean well over. In splitting this book however, AFC felt heavily one-sided. Not to say that I didn’t enjoy the book, I did, but due to half of the cast of characters being cut, the book left me wanting more, and less. AFC was still, at half its content, around 775 pages long. 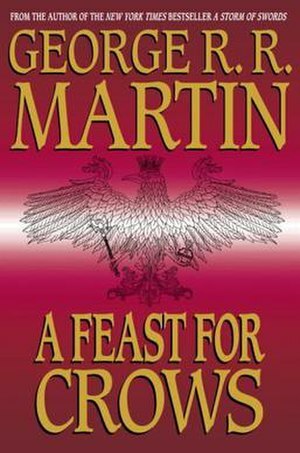 Although not my favorite book in this series so far, AFC is still a must read for any Martin fan. Especially if you are knee-deep in this series. George R. R. Martin is an incredible storyteller and an inspiration for every author/writer. His cast of characters is immense, not to mention the number of details he somehow manages to not only hold inside his head, but also manages to keep straight. Martin is currently working on The Winds of Winter, the sixth book in his Fantasy series, A Song of Fire and Ice. I know we all hope this book will be a quick release. **For a further review of this book, see my Goodreads shelves to the right. Over there >>>>>> As well as reviews and opinions of previous books in this incredible series. This entry was posted on February 23, 2012 by Laney. It was filed under Author, Blogging, Books, Inspiration, Publishing, Reading, Reviews, Thoughts, Writer, Writing and was tagged with A Song of Fire and Ice, Author, Book Reviews, Dance With Dragons, feast for crows, george r r martin, laney mcmann, Martin, Song of Ice & Fire, Winds of Winter. I struggled with this book too. I didn’t like that some of my favorite characters weren’t in the book and I had a hard time keeping all the numerous new characters straight. Agreed. I kept wondering when Tyrion would show up, or Jon Snow. The contrast between AFC and SOS was massive. Hey! No problem, it’s an important one on the Blogroll!